Rags N Quilts: I'm on a roll! Seems this is the summer for good quilting news for me. 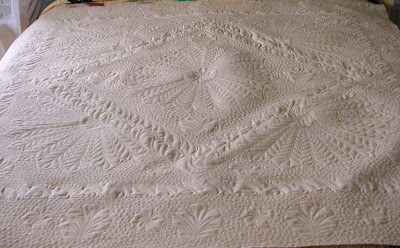 Today I got a call that this quilt I had done for a customer won Best of Show in her county fair in Indiana! So that helped me focus and finish another show quilt for another customer. Now I can get ready for the girls to arrive on Wednesday! WOW, the whole cloth is gorgeous!!! Congratulations you are on a serious roll!! Did you call Mom? She was telling Nancy about your ribbons the last day I was there. Of course, then she had to say how proud she was of me for my charity quilting. I guess she thought my feelings would be hurt if I heard her praising you! This is one I really liked when I saw it on your webshots album. Kind of puts my Swirls quilting to shame. Oh well, to each their own. The quilt is pretty, but your quilting is beautiful! 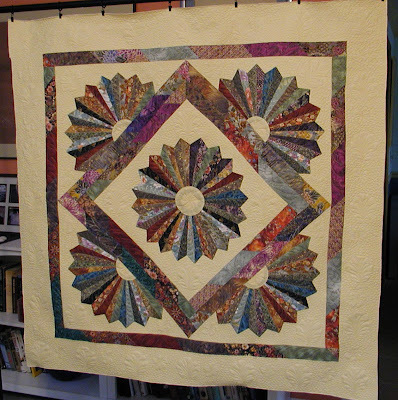 The quilting is fabulous and looks like a lot of work. You certainly deserve a prize for this quilt.